There are 2 types of Japanese adverbs 副詞 (fukushi). One can be formed by making simple change to adjectives. The other type of adverbs consists of some pre-defined characters which do not derived from adjectives. Meaning: Teacher wrote a big word. 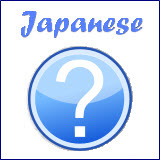 ...the adjective おおきい (ookii - big) is describing the noun じ (ji - word). Meaning: Teacher wrote the word with big strokes. Meaning: Teacher wrote the word neatly. In the above 2 examples, the adverbs おおきく (ookiku) and きれいに (kirei ni) are describing the actions of teacher (how she wrote the word). How to change an adjective to an adverb? Since there are 2 types of adjectives (i-adjective and na-adjective), there are 2 different rules governing the change. For i-adjectives, you just need to replace the い (i) in the adjective with く (ku). 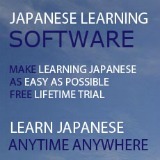 Whereas for na-adjectives, append the hiragana に (ni) to the adjective. Meaning: I went home early/late last night. Meaning: My friend always walks quickly/slowly. Meaning: Teacher speaks Japanese nicely/skillfully. There are 2 meanings for はやい (hayai). It can mean early or fast depending on the context of the sentence. Similarly, おそい (osoi) can mean late or slowly depending on the sentence's context. 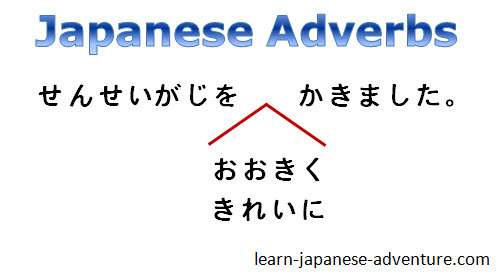 The second type of Japanese adverbs is not derived from adjectives. This group of adverbs are regular adverbs which we use frequently in sentences. I will list some of the most commonly used adverbs with examples. Meaning: I am a little tired. Meaning: I am watching tv almost every day. Meaning: He is not very tall. Meaning: She doesn't drink (alcohol) at all. 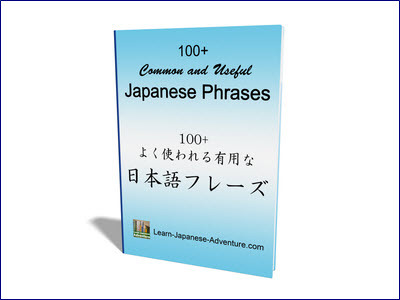 There are many more regular Japanese adverbs which I will introduce in the Japanese words and vocabulary section.